I never (ever) thought I’d say this but… I think I’m addicted to brussels sprouts. I can’t get enough of them. I like them roasted. I like them deep-fried. I like them stir-fried. I just don’t like them boiled (ew). 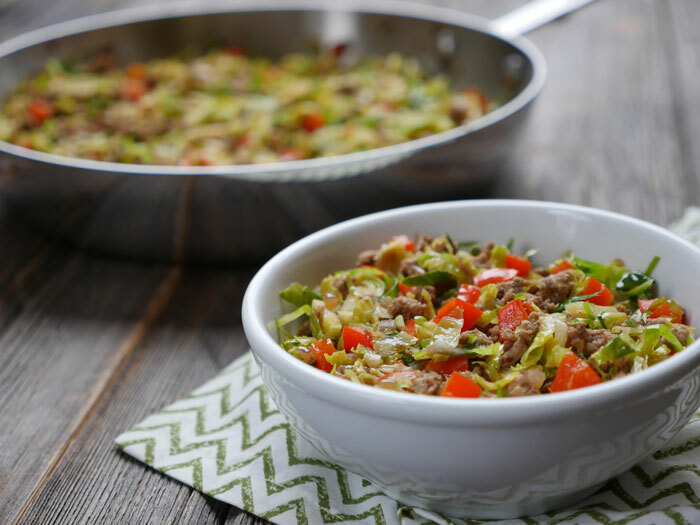 Let me introduce you to the rest of my friends – the other players in this skillet game: ground turkey, red bell pepper and a blend of spices. Then there’s brussels, who you know. Obviously. On their own, these players are pretty chill. But together, they make for an awesome team. Like, so good I’d put them in my bracket. Oh wait, brackets are for basketball right? Wrong season, wrong sport… I should probably stop using sports analogies when talking about food (but I won’t). But, if I was rooting for a team, it’d be… TEAM BRUSSELS SPROUTS. I’m pretty sure people would be overall happier if we rooted for food instead of sports. I feel like sports just makes people stress out? Hm, I just thought of this… if I could root for any food, I’d root for roots! Just so I could say I was rooting for roots. Goooo Beets! 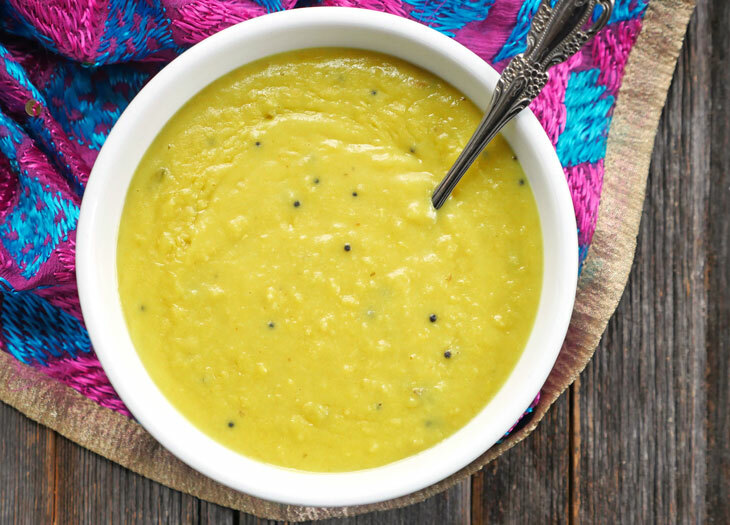 Melt 2 tablespoons of coconut oil in a large skillet over medium heat. Add the onion and stir-fry for 5 minutes or until the onions are soft. Then add the ground turkey, garlic and spices and cook for 15-20 minutes, or until the meat is completely cooked through and no longer pink. 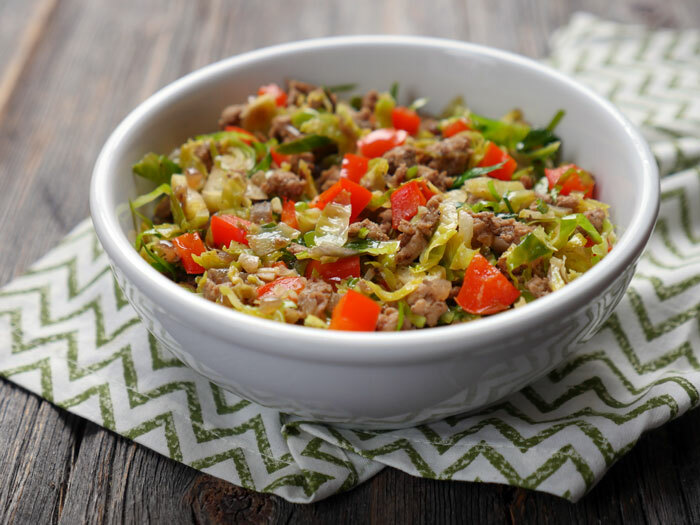 Set some of the meat aside in a bowl to make room for the brussels sprouts. Melt the remaining coconut oil in the skillet and add brussels sprouts and a bell pepper. Stir-fry for 5 minutes, or until the vegetables are tender. Add the meat back into the pan and mix well. Serve. I just came upon your blog last week and am excited about all of your recipes! My family did the Whole30 several year ago and since then follow a Paleo/unprocessed lifestyle most of the time. This month we are actually doing the Whole30 again and enjoyed your spaghetti squash breakfast cups this weekend! Very excited to try other recipes — they look great in photos! Thanks for sharing all of this! I’m so glad you found my blog, Patti! 🙂 I hope you love all of the recipes you try – please let me know how other recipes turn out for you! Just wanted to let you know I made this last night and it was very good. Plus it really looks pretty in the pan/on plates. I tweaked it every so slightly and used 1 pound of brussels sprouts and added fish sauce to it while sautéing. Thanks for sharing — we enjoyed! Thank you so much for this recipe. Can’t tell you how many times and variations on it I’ve made! I find the recipe, as written, a little dry, so I add a 1/4 cup of chicken broth after browning the veggies to steam them a bit. Serve along side avocado cream. Delicious. Happy to hear that you like it, Beth! Thanks for sharing your addition! By any chance, would you know the container count for someone eating this on the 21 day fix? Wow!! Making this as i type this and after several sample tastes all i can say is hurry up timer! Very tasty indeed! Thx! I made this today, as something my daughter can grab and go before work. She loves brussels sprouts and we are both trying to watch what we eat, and eat more naturally! It is very good. I actually added it to some eggs and made an egg scramble with it for an extra protein boost before I head to work. I normally don’t have time for a meal, and sometimes make not so great on the move choices, so this should keep me fueled for a good bit of my 9 1/2 hr day! 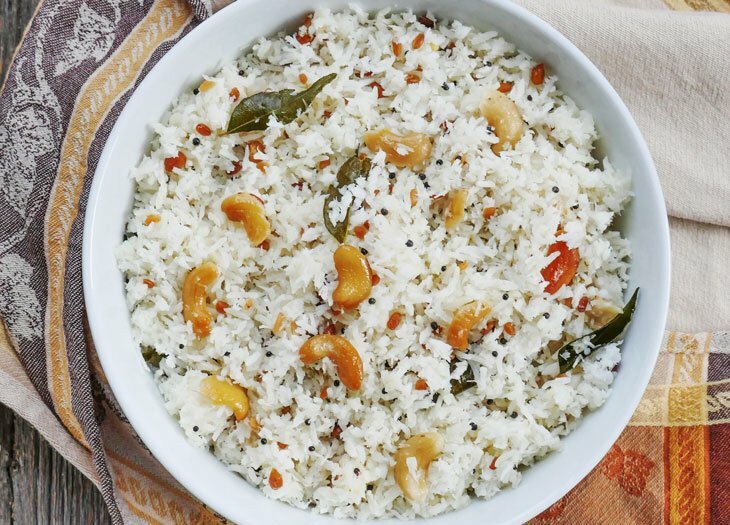 I love this recipe, quick and delicious. I did course chop the brussels. What a quick Sunday night make for the week. Whipped this up pretty quickly. Added a 1/2 tsp of cumin to the turkey and some salt and spices to the veggies before I added the turkey back in. Thanks for sharing! 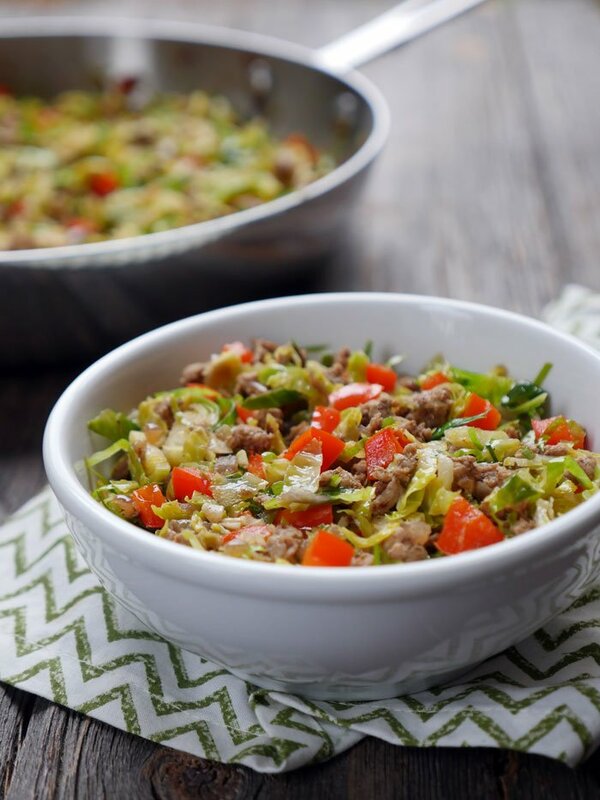 Okay – I am never going back to boiled Brussel’s…..this simple recipe is outstanding! Was going to make it for supper but decided to try it on myself first at lunch and am truly impressed. Absolutely delicious. Going to have to find more Brussel sprouts so I can make it again as while I am writing this review I am thinking about sneaking back to the pot for a bit more. Thanks Ashley! I tried this recipe this afternoon for lunch and love it. Even the kids ate it and didn’t realize they were eating Brussels sprouts. I added baby spinach while the Brussels were cooking and served the dish with diced tomatoes and avocado on top. So yummy. We will definitely be eating this again. Wow, so happy to hear that! Thanks so much for letting me know how it turned out for you, Amber! Do you cook the brussel sprouts first? If so, how? Is there a good way to shred them? Looking forward to trying this. I buy the frozen brussels and just thaw and chop them up and throw them in! Just made this with ground chicken, which I only cooked for about 10 minutes because it is very delicate. Overall taste was delicious and I grabbed about 1/2 cup of the penne pasta water and served it over the penne. My husband thought I had put Indian spices in the dish. He loved the subtle heat and we have leftovers for tomorrow. This would be great inside pita too! How much is in a serving? One cup? Came upon your blog last week and I’m in love! I made this recipe tonight and had some for dinner, and it was soooo delicious! I made a batch for the week and can’t wait to start making more of your recipes! 3 ingredient naan next! This was really easy and delicious. Added some extra Brussels and fresh jalepeno . Extra garlic and fish sauce. Served it over brown rice. Wonderful! This was outstanding, thank you! I added lime zest and the juice of two lime wedges when adding the meat back to the vegetables, and served with the remaining lime wedges on the side. So good and definitely adding to the monthly rotation! I switched your recipe up a little – used poblano pepper and spicy pork sausage. Just halved the sprouts and added some chicken stock at the end. Amazing! Fantastic! We didn’t have any cayenne so we subbed curry powder and it was delicious! Can’t wait to make it again! 🙂 thanks! 5 days into being treated for leaky gutt plus am allergic to dairy. We used to do Blue Apron but it no longer fits the plan. I can’t find a meal delivery kit with whole30 that’s not horribly expensive. I had these ingredients already and was happy to find your recipe. The first that popped up on my search. Going to look at your other recipes right now. Made this tonight. Delicious! Thanks for another great recipe. My family and I are loving all of the recipes that we have tried so far! They are fabulous! I was wondering for this recipe when you specify chili powder, do you mean Indian chili powder or are you referring to the version found here in the U.S. that is a mix of lots of different spices traditionally used to make chili soup? Thanks so much! Tina, so happy to hear that!! 🙂 I use Kashmiri chili powder in my recipes every now and then but always label it with the word Kashmiri. I don’t use Indian chili powder in my recipes – just cayenne – so if a recipe calls for “chili” then use American chili powder 🙂 I hope that helps! I’ve also linked to the brand of chili powder I use as well. Love this recipe. I wasn’t sure how it would turn out but my husband and I loved it. Thanks for sharing. 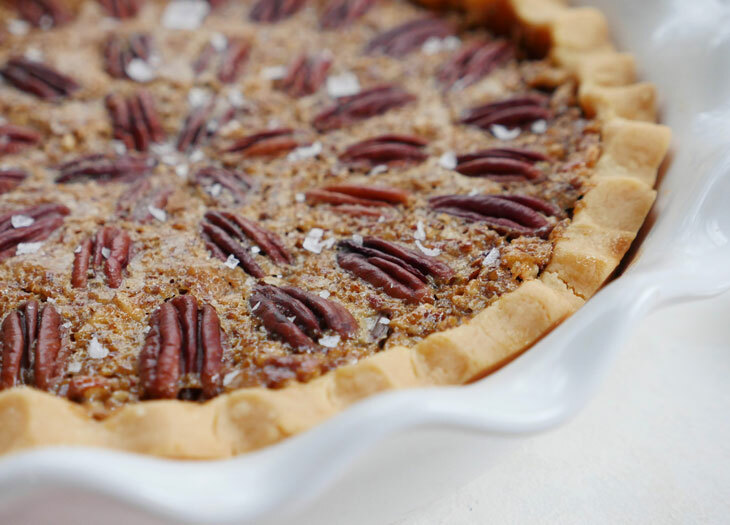 This is a very nice sounding board recipe that is super easy to modify! 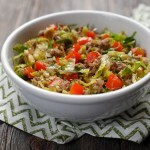 I made this last night with ground turkey, shredded carrots, onions, a little bit of riced cauliflower (the cast off bits from slicing cauliflower steaks for another meal), and (of course) brussel sprouts. As far as seasoning goes, I went with some salt, pepper, garlic, paprika, and a little bit of thyme, and added a bit of Worcestershire sauce in the final minutes of skillet time. It was delicious, clean up was super easy, and it made for a low-key and healthy meal after a long day of work. So happy to hear that, thanks Patty! Made this for my family, and they really enjoyed it! Thank you! That’s great to hear 🙂 Thanks for letting me know how it turned out for you! Hi Rose, so happy to hear that!! I just added the nutritional info to the recipe card for you 🙂 hope that helps! Absolutely loved this, as did the entire family. I added a bag of fresh Brussels, deleted the pepper, as I am a wuss, and topped it with lemon juice before serving with Butter Lettus leaves. It was delightful! I doubled the recipe and it tasted even better the next day! I am SO thankful for this delicious homemade dinner, which will be a staple in my secret arsenal of recipes. Love this recipe! I’ve made it several times. Even the kids like it, well my picky 17 yr old is still iffy lol Thank you for sharing. I’m now following you for more delicious recipes. On what planet can an average cook, (not a sushi chef) prepare and dice an onion and a bell pepper, clean and mince 4 garlic cloves, and clean and shred a cup of brussels sprouts, in a 10 minute time span? It took me considerably longer than that. In my opinion, the Prep Time stated was WAY off. I’m not a sushi chef 😉 Just a mama to a toddler who likes to cook. You can buy pre-shredded brussels and minced garlic for less prep – or use a garlic mincer to make the process go faster. I’ll take that 6 out of 10 though – glad you sort of liked it!